I love this little pink dove planter. I scored it at Savers a while back for about 3 bucks! 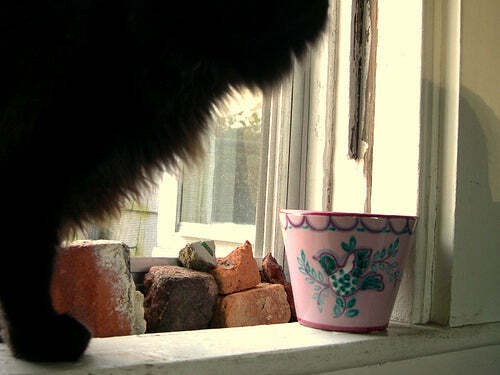 Cats do love windowsills, don't they? And sheets. Every time I change the sheets, Thor is there immediately frolicking under them. Back to the pottery- such uncommon colors, don't you think? I mean, for this type of handpainted Italian ceramics? I love it. It now holds toothbrushes in my pink bathroom. Perfect. Tee hee, I love how that looks with the rubber duckie. Just a smattering of goodies for show and tell. Meanwhile, remember how I said I was all done with my design project? Yeah, well... revisions! So I have spent the whole weekend tweaking the designs. Soon I will really be done. And then there will be much rejoicing and blogging and eating of creme brulee.